Pickled Peaches and Blueberries for Blueberry and Peach Day! Pickled Peaches and Blueberries are a sweet-and-sour way to make the most of summer’s bounty. Use them on salads, ice cream, or in cocktails this summer! 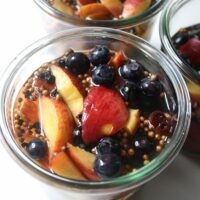 These pickled peaches and blueberries are the recipe I’ll be teaching at my next Freedom Farmers Market food preservation workshop. They’re sweet, sour, spiced, and fantastical. I’m so into the theme days they organize at Freedom Farmers Market. My last workshop there was for Strawberry Day, and this is for Blueberry and Peach Day on June 27th. There also may or may not be a Tomato Day coming up later this summer, and maybe I have a recipe in the works for that. Who knows! 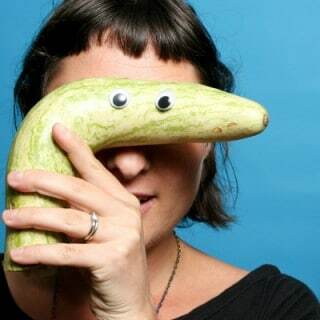 If you’re new to the wonderful world of fruit pickles, don’t be intimidated. Pickling fruit is as simple as pickling veggies, and the results are what my sister-in-law, Liz, would call “a party in your mouth.” These sweet and sour peach pickles are such a lovely way to preserve some of summer’s peach and blueberry goodness. Just like when you pickle cucumbers, or summer squash, you slice your fruit, prepare the brine, combine, and chill. It really couldn’t be easier. In honor of Blueberry and Peach Day, I’m doing a whole Peach Blueberry Week over here! I think folks sometimes don’t know what to do with fruit pickles once they’re made, so I have a salad recipe coming up tomorrow and a cocktail on Friday to help you not just make pickled peaches and blueberries, but eat them, too. 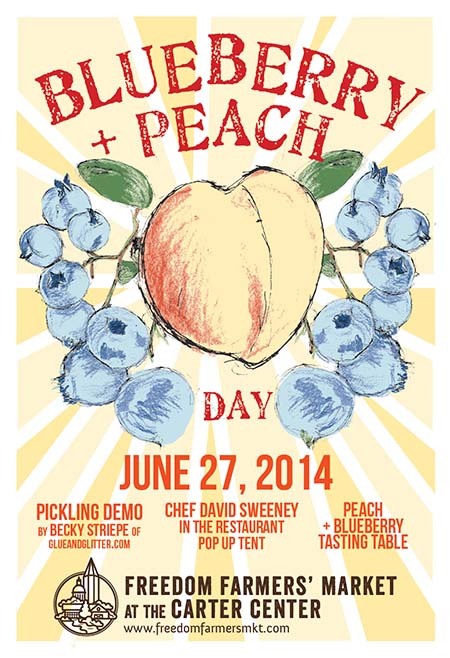 Let Peach Blueberry Week begin! Spoon them over ice cream. Drop them into a glass of sparkling water for instant soda. Use them in sushi rolls. Serve alongside a sandwich instead of a more traditional pickle spear. Eat them with a fork right out of the jar. 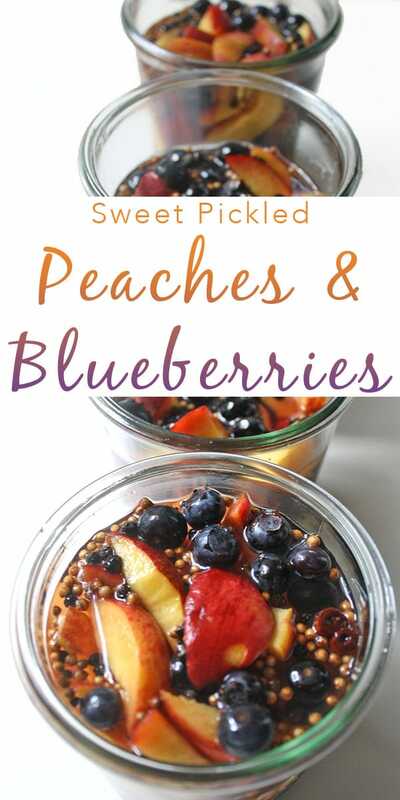 Sweet-and-sour Pickled Peaches and Blueberries are delicious in cocktails, on salads, on ice cream, and more! 2 1/2 cups sliced peaches. - Slices should be about 1" thick (about 6 small peaches). 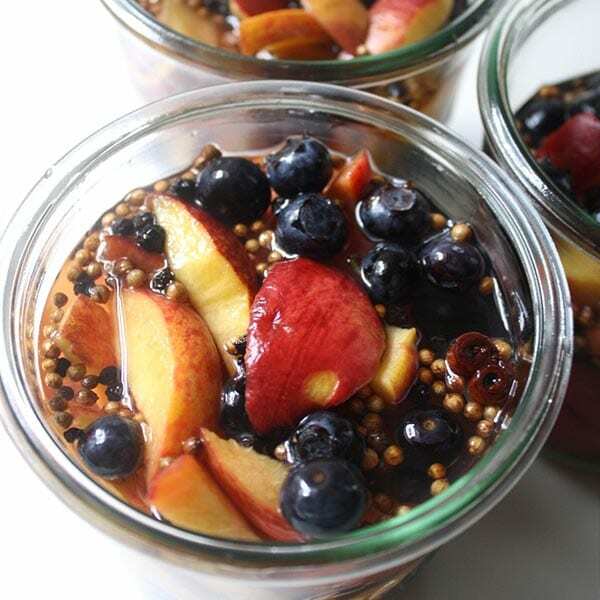 Divide the peaches and blueberries between 3 pint-sized mason jars. Make the brine: Put all of the remaining ingredients into a sauce pot over high heat, and boil until the sugar is dissolved. 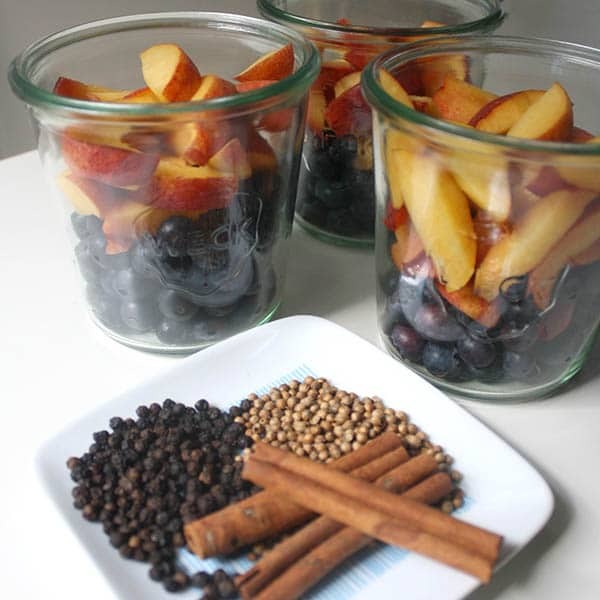 Use a ladle to divide the coriander seeds, peppercorns, and cinnamon sticks between your jars. If you have an extra cinnamon stick, you can toss it into the compost. Refrigerate until you’re ready to eat. You want the fruit to steep for at least an hour in the fridge, but the longer they steep, the deeper the flavor will get. They will keep for 2-3 weeks in the fridge. Can chicory be used for this recipe instead of sugar? That’s a good question! I’m not totally sure. The sugar in this recipe works as a preservative, so I’d definitely monkey with it with caution.